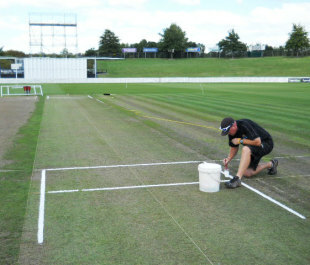 Green Hamilton pitch expected to "brown off"
The Seddon Park groundsman, Karl Johnson, used an odd analogy to explain the state of the pitch two days before the start of the second Test between New Zealand and South Africa. "The bride doesn't put on her dress and makeup until her wedding day, does she?" Johnson asked the gawking group of people that were gazing at the surface. The reason they were staring at the strip in wonderment, the way a crowded room would at a bride, was not because the surface looked as beautiful but because of its colour. It was green. Perhaps the same green the SuperSport Park pitch in Centurion has been for the last two years. The kind of green that New Zealand threatened to produce after they decided a four-man pace attack would be the direction their Test team would take. The kind of green that will make Dale Steyn salivate. South Africa would welcome a pace-friendly pitch, with the quality of the attack they possess, so their opening batsman Alviro Petersen does not expect Johnson to let them have that advantage. "It looks a bit green but I don't know how long the green will last because if you look at our team, at the arsenal we've got, I don't think they will leave it green for much longer," Petersen said. "If they do leave it green, hopefully it will bring both teams into the game and hopefully we will get a result." New Zealand's team will definitely have one change to it, after Tim Southee was dropped from the squad. One of Brent Arnel, Mark Gillespie or Tarun Nethula will replace Southee and Petersen said he had his doubts that it will be Nethula. "I don't know much about the legspinner. If they want to leave this thing green, I don't know why they brought a legspinner into their squad. Maybe they know something we don't." Perhaps New Zealand know that spinners have done well in the latter stages of matches in Hamilton, on its more traditional Test pitch. If that does happen, Johnson's pitch may end up being an ideal Test track: helpful for the seamers on the first morning, good for batting through the middle and offering some turn at the end. John Wright, the New Zealand coach, though, said he did not see the pitch giving the spinners much assistance. "I don't think it's a raging turner," Wright said, making Nethula's chances of playing seem slim. "But if he doesn't play he'll be very useful in the nets. Also Tarun has done well and it's just another chance for him to be around the group. He may get a game, but to be honest having seen the pitch yesterday it may have to change a little bit. But he's an option." Wright expects the green covering to fade away in the next two days. "It's always been a bit that way; two days out in the sunshine and it will brown off," he said. "This is a good batting track. It's probably going to look a little different tomorrow to what it does today, and traditionally it's not a bad place to bat." Johnson confirmed that Wright had not requested anything special but told the Waikato Times that the coach had mentioned "a bit of seam movement and a medium-paced track." The eventual bride will have a fairly thick grass covering, although it will not be as green. The weather forecast is lukewarm and dry in the lead-up to the match, which will give Johnson ample time to put the makeup on the strip.